Yup. It’s done. I rode up to the top of Vail Pass from Vail Village yesterday. Just about 35 miles round trip. It’s a perk of being underemployed for the summer. But not only did I survive this little number, I pretty much owned it. And by owned it, I mean that in my head I thought I did really good. Pay no mind to all the superheroes getting after it on their lunch hour and passing me. I held my own. I think. “You’re gonna need a triple crank if you plan to ride the Pass.”– actually, no I didn’t. I did just fine with my compact, thank you. Mostly because I have legs of steel now. “What do you need a triple crank for? 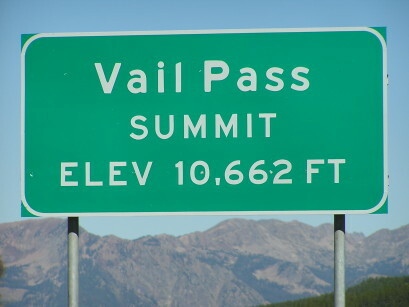 Are you gonna even ride Vail Pass? You’re probably just gonna ride Brush Creek and Highway 6.” Why? Because I am too fat and out of shape to ride up the Pass? Well, not anymore, sweetheart. I gotta say that it felt really good, especially near the top on the way up, despite the fact that I could have used an extra water bottle, some gel, and a dose of sunscreen (whoops!). And it was fun to read all the encouragement and jokes people wrote on the path for last year’s USA Pro Cycling Challenge time trial. Plus, my friend Nancy provided plenty of good conversation and navigational assistance, without which I would have been pretty lost despite living in this valley for over a decade. Oh? And did I mention I had already knocked out my training session with Trainer Guy at 6 AM? Yeah, I just did. So, even though riding to the top of Vail Pass is probably just a lunch workout for half this Valley, I maintain that it was still a difficult task and not EVERYONE does it. If they did, it would be a lot more crowded at the top. If you’re a mere mortal like me, you gotta use your momentum to push yourself every day. 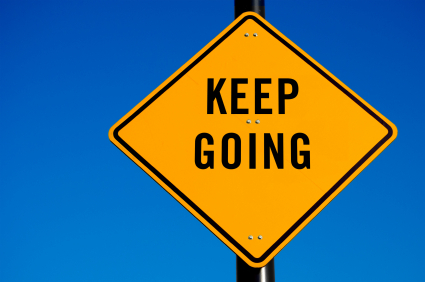 Keep DOING and keep GOING. It’s bound to take you to the top of something!